Editor: I know, I know, this has nothing directly relating to OB but … We posted this to demonstrate what is going on across the country. 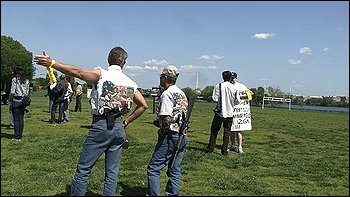 Here, on the 15th anniversary of the worst domestic terrorist incident in American history, armed vigilantes rally and spout violent rhetoric against President Obama, the Democrats and our country. They came in camouflage and ammunition vests, carrying AK-47s slung over their shoulders and pistols in their hip holsters. They were in Northern Virginia, on the 15th anniversary of the Oklahoma City bombing, to stand on federal land and to voice violent thoughts. They did this in a strictly nonviolent fashion, naturally. “Let me hang out my shingle,” Mike Vanderboegh shouted to the 75 armed men and women at Fort Hunt Park in Alexandria on Monday morning. Vanderboegh, leader of the “Three Percent” movement, a gun-owners’ rights group, slammed down a brick on the stage bearing the Roman numeral III. This was a reference to his call for his followers to “break the windows of hundreds, thousands of Democrat Party headquarters” after health-care legislation passed. Some of them did as they were told. The 19th of April has acquired a unique mythology of resistance and violence: the battles of Lexington and Concord in 1775, the Warsaw ghetto uprising in 1943, the sacking of the Branch Davidian compound in 1993, the Oklahoma City bombing in 1995. Now the date has a new significance as the moment when the militia movement went from the blogs and the backwoods, mustered across the river from the capital, and invited the world’s media to come in and hear its warnings. In a sense, it was good news: Better for militia leaders and activists in the “patriot” movement to be participating in a peaceful political protest than plotting in their basements over an issue of Soldier of Fortune. And the participation was weak; by the time the rally moved from Fort Hunt to Gravelly Point Park near National Airport in the afternoon, the 75 gun carriers were easily outnumbered by a journalistic mob that included representatives from Switzerland, France and Ireland. On the other hand, the event was a sign of just how confident the militia leaders are that their cause has moved, for the first time, from the fringe to the mainstream. The demonstrators brought their guns to Virginia from New Mexico, New Hampshire, Florida and elsewhere. Among the group was Tim Hammond, who carried two pistols, a rifle and plenty of ammunition as part of an all-black outfit that included a black tricorn hat. Hammond, who said he flew in from California, told another demonstrator he believes that President Obama is the antichrist. “If he’s not the antichrist, he’s pretty close,” the second man concurred. Soon after this, event organizers whisked Hammond off to make sure he had met the rules for participation, including the use of a “chamber flag” to show that the rifle wasn’t loaded; those in compliance were given a yellow armband. Though their words were ominous and menacing, the participants went out of their way to demonstrate their peaceful intent (a new law, signed by Obama, allows them to carry weapons openly on federal parkland). Wright brought his young granddaughter, Alyssa, who wore yellow hair ribbons and sang the national anthem for the crowd. Vanderboegh said some participants were “pretty disappointed at how few people turned out here,” but then likened them to another “determined minority,” the Jews of the Warsaw ghetto. He recounted for the crowd his successful calls for bricks to be thrown into Democrats’ offices. “I hope to make them understand that the situation was coming to a fundamental break when people innocent and guilty alike were going to begin dying for their own stupid failure to comprehend the real situation that we are all in,” he warned. Stories like this make my blood boil. These used to be on the fringe of society, but now they’re standing in view of the capitol building, openly carrying rifles and assault weapons. Can you imagine what the reaction would have been if a bunch of lefties showed up with guns? But most of the lefties I know don’t even have a gun. sickening, really. these aren’t “veiled” threats….those folks are ready to load the guns and use them – on our president. i have never held a gun, let alone shoot one. theres only one reason they exist, and thats to kill or maim a living being. and marijuana is illegal why? In fact, open carry is now allowed in national parks due to a law Obama recently signed. Unlike most people here probably, I’m a Second Amendment proponent. Chris, right on, right on! Not sure how to react to these talk show warriors. On one end (to me anyway), they are simply a bunch of goober wannabes, but on the other they may be just crazy enough to start an actual shoot out with federal authorities. Are they truly dangerous people or just people to chuckle at?